The Culinary Arts program provides hands-on experience for young adults in the Transition and Post-Graduate programs at NFSSE. It is designed to give both hands-on experience for independent living and the training necessary for future employment in a culinary field. Through partnerships with various local restaurants and food-related businesses, our Culinary Arts team provides our special chefs with on-the-job training to help them develop skills in a real-life setting. 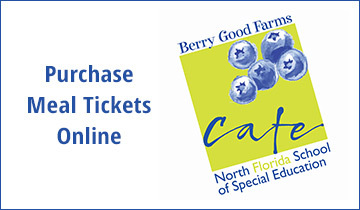 In July 2017, The Berry Good Farms Cafe was launched at Arc Jax Village, a residential community for adults with intellectual and developmental differences. Berry Good Farms Culinary students prepare fresh, healthy dinner options for residents through this partnership. Culinary Arts students learn to incorporate the seasonal produce from Berry Good Farms into Healthy! Beautiful! Delicious! menu items for lunches and value-added offerings like fresh pesto, hummus and herb mixes and dips. The Farm team and the Culinary Arts team work hand-in-hand to showcase and utilize the fresh produce, herbs and fruits grown on our campus. Culinary Arts students are educated in proper food handling, knife skills, ingredient measurement, the creation of shopping lists, adherence to recipes, food preparation and cooking, and customer service. An important component of the Culinary Arts Program is the emphasis that our team puts on the importance of healthy and fresh food choices. As our Culinary Arts students hone their skills and pursue compensated employment, they gain a greater sense of independence and are equipped with the tools necessary to make positive lifestyle choices.